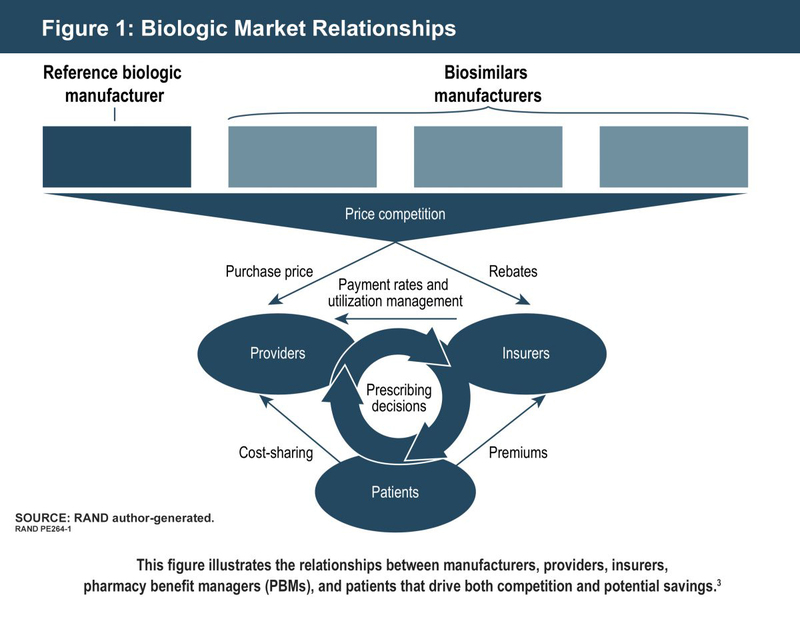 Biosimilars can potentially reduce costs for consumers by creating price competition for products that previously faced few market competitors. With the potential for more FDA approvals of biosimilars, the question of how to encourage uptake of biosimilars by prescribers and patients arises. Unlike most other countries with government-funded healthcare that can control for or reward the increased use of biosimilars, the United States has the challenge of incentivizing physicians, patients, and payers. Uptake may be facilitated by providing education on biosimilars, placing biosimilars on lower formulary tiers, and encouraging payers to incentivize switching to biosimilars by employing price discounts.10 With changes in how treatment is provided and paid for in the United States, acceptance and use of biosimilars must be monitored to assess and overcome barriers to uptake. Philippidis A. The top 15 best-selling drugs of 2016. Genetic Engineering & Biotechnology News website. https://www.genengnews.com/the-lists/the-top-15-best-selling-drugs-of-2016/77900868. March 06, 2017. Accessed February 16, 2018. The next frontier for improved access to medicines: biosimilars and interchangeable biologic products. The Biosimilars Council website. https://biosimilarscouncil.org/wp-content/uploads/2017/03/Biosimilars-Handbook.pdf. Accessed February 16, 2018. Mulcahy AW, Hlávka JP, Case SP. Biosimilar cost savings in the United States. RAND Corporation website. https://www.rand.org/content/dam/rand/pubs/perspectives/PE200/PE264/RAND_PE264.pdf. Accessed February 16, 2018. Can biosimilar drugs lower Medicare Part B drug spending? The PEW Charitable Trusts website. http://www.pewtrusts.org/en/research-and-analysis/issue-briefs/2017/01/can-biosimilar-drugs-lower-medicare-part-b-drug-spending?utm_campaign=LM+-+GP+-+SDRI+-+Biosimilars+Medicare+-+12+28+16&utm_medium=email&utm_. January 3, 2017. Accessed February 16, 2018. Oskouei S. CMS biosimilar reimbursement shift: what you need to know. The Center for Biosimilars website. http://www.centerforbiosimilars.com/contributor/sonia-oskouei/2017/10/cms-biosimilar-reimbursement-shift-what-you-need-to-know. November 16, 2017. Accessed February 16, 2018. Kopenski FR, Holcomb K. Understanding biosimilars and projecting the cost savings to employers: update. Milliman website. http://www.milliman.com/uploadedFiles/insight/2015/understanding-biosimilars.pdf. June 29, 2015. Accessed February 16, 2018. Tesser JRP, Furst DE, Jacobs R. Biosimilars and the extrapolation of indications for inflammatory conditions. Biologics. 2017;11:5-11. Olech E. Biosimilars: rationale and current regulatory landscape. Semin Arthritis Rheum. 2016;45:S1-S10. 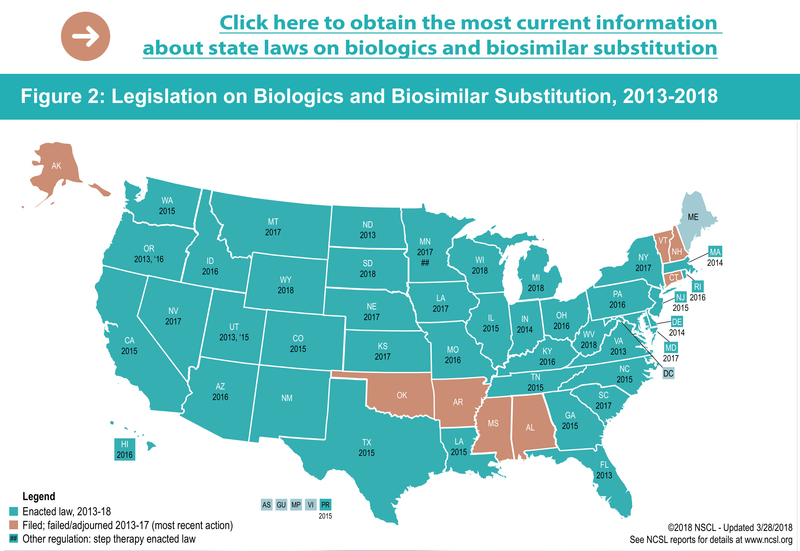 State laws and legislation related to biologic medications and substitution of biosimilars. National Conference of State Legislatures website. http://www.ncsl.org/research/health/state-laws-and-legislation-related-to-biologic-medications-and-substitution-of-biosimilars.aspx. February 8, 2018. Accessed February 16, 2018. Felix AE, Gupta A, Cohen JP, Riggs K. Barriers to market uptake of biosimilars in the US. GaBI J. 2014;3:108-115.